Came Back Haunted is a single that was released on June 6, 2013, for streaming on SoundCloud as part of the Definitive NIN: The Singles (1989-2013) playlist and also as a digital-only single on Amazon and iTunes. The front page of nin.com was updated to present the song for listening. A two-track promotional CD acetate was also released. This single marks NIN's very first release on Columbia Records. It does not carry a halo number. 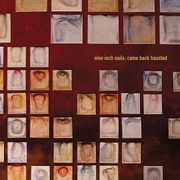 Came Back Haunted was made available with pre-orders of Hesitation Marks as MP3 (16bit/44.1kHz, ~319 kb/s VBR) or high-resolution lossless formats ALAC, FLAC or WAV (all 24/48). It was also sold as a standalone digital single on Amazon and iTunes, making it NIN's first digital-only commercial release. The artwork for this single was created by Russell Mills, whose art was previously used for March Of The Pigs, The Downward Spiral, Further Down The Spiral and Closure. The artwork for the promo CD is the same as the digital release. Mills' official site gives the title and materials of the painting used: "Dust of Mens' Tears II" (Oils, acrylics in dispersion in coin envelopes, burning on velvet, on wood). This page was last modified on 21 February 2014, at 03:14. This page has been accessed 22,362 times.